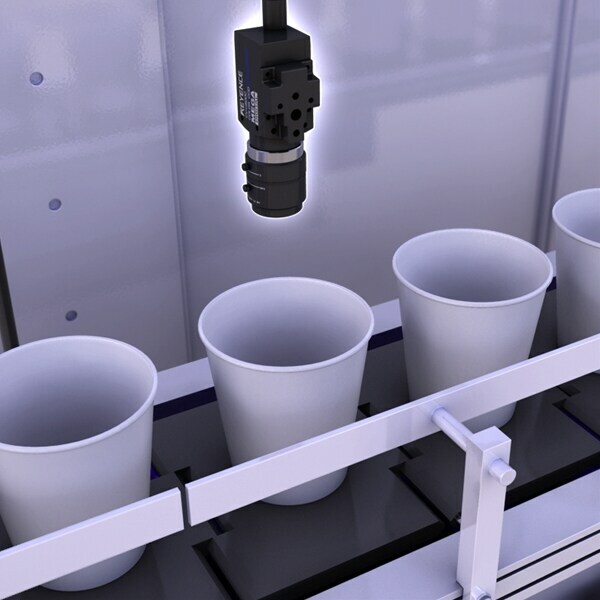 The vision system inspects for contaminants inside paper cups. Fine Color Processing extracts a color's hue, saturation, and brightness values. Stains are then processed as variances in any of these values. Gradual changes caused by seams or lighting variations on curved surfaces can then be factored out in order to eliminate false detections. Color extraction was used to detect flaws and foreign particles inside of paper cups, but seams were often detected as flaws. The CV-5000 Series Fine Color Processing can adjust for gradual changes in color such as a seam and extracts the stark differences in hue caused by a stain.